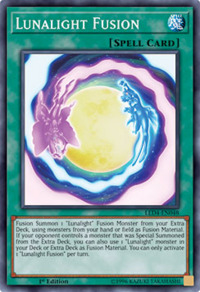 Fusion Summon 1 “Lunalight” Fusion Monster from your Extra Deck, using monsters from your hand or field as Fusion Material. 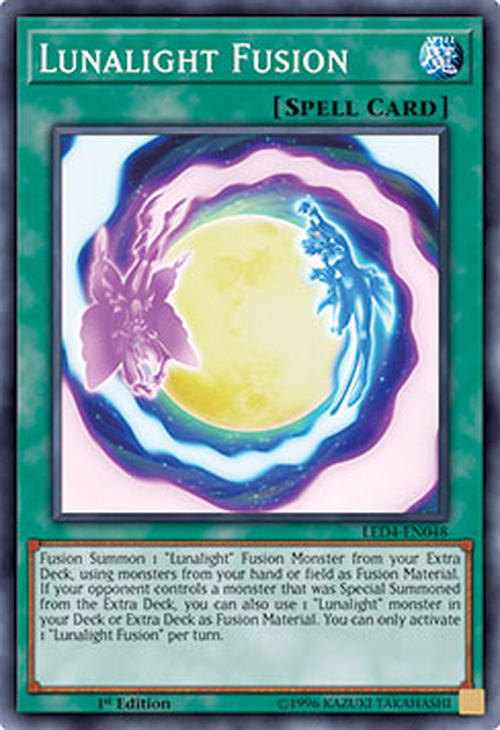 If your opponent controls a monster that was Special Summoned from the Extra Deck, you can also use 1 “Lunalight” monster in your Deck or Extra Deck as Fusion Material. You can only activate 1 "Lunalight Fusion" per turn. Lunalight Purple Butterfly and Lunalight Blue Cat appear in this card's artwork.